Katharine the Shark, a great white named to honor Cape Cod native and Wellesley alumna Katharine Lee Bates class of 1880, was tagged last August off Cape Cod by OCEARCH, a nonprofit organization that supports research on great white sharks and other large apex predators. 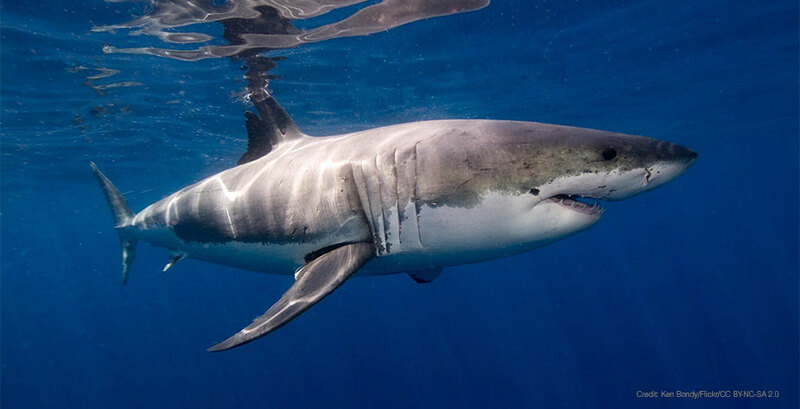 The 14-foot, 2,300-pound juvenile female is currently hanging out near North Carolina (she can be tracked through the organization’s website or, if you prefer, follow her on Twitter), not far from where Melaina Wright ’15 conducted research on another shark species last summer. (Wright’s work was not affiliated with OCEARCH). “The focus of my research was the genetic testing of mako shark tissue samples from mako sharks that were caught as bycatch by fishermen off the coast of North Carolina,” said Wright, a biological sciences major and environmental studies minor who spent last summer at the Duke Marine Lab. Wright focused on the “highly migratory” shortfin mako shark, using gene sequencing to assess global and regional populations. Wright presented her research, which was funded through the National Science Foundation (NSF) Research Experiences for Undergraduates (REU) program, at the Ruhlman conference last year. Shark researchers, it seems, are also highly migratory -- this summer she is working at the Scripps Institution of Oceanography in California, where her research is focused on determining the sampling requirements for creating a long-term ecological monitoring program for fish species. Catarina Pien ’10 is also on the West Coast, working as a graduate student in the Pacific Shark Research Center at Moss Landing Marine Laboratories. “Most people think of shark science as crazy white shark cage diving and tagging,” Pien said. The lab were she works, headed by Dr. Dave Ebert, studies various aspects of the biology of elasmobranchs, a subclass of cartilaginous fish that includes sharks, rays, and chimaeras, with special focuses on describing new species. Pien’s thesis is focusing on the life history of the Thornback Ray, a species found along the California coast. It also involves surveying the sharks and rays that inhabit Elkhorn Slough, an estuary located behind Moss Landing, and studying how populations have changed over the last few decades. Additionally, she is working on a project describing the extended range of some elasmobranchs from Oman and another is describing a potentially new species of Torpedo Ray from the Seychelles. “Although sharks are common in popular culture, they are surprisingly understudied, and many species are still undiscovered or undescribed, especially in areas with limited research facilities,” she said. As a student at Wellesley, Pien said she was drawn to general biology but through classes, travel, and independent research opportunities–which included some work in Lake Waban (though, presumably, not on sharks)—she became particularly interested in studying the marine world. “The research skills I gained during my time at Wellesley trained me as a scientist and independent thinker, and my opportunities provided me with experience and a glimpse into the science I wanted to pursue,” she said.